I was tempted to head this blog ”Minister, you’re no Jennie Lee’, but I decided that would be a bit unfair. Ed Vaizey is obviously passionate about his brief, and is scrupulous in his run through the 50 years between the first White Paper on the arts, overseen by Jennie Lee, and his own, published recently. He gives due credit to his predecessors, regardless of party. But although there are clear continuities in some areas of attention, such as access and education, it is in the discontinuities and disconnections that the real story is told, and where the new White Paper falls down against not just Lee’s vision, but, more importantly, in relation to what’s needed now. 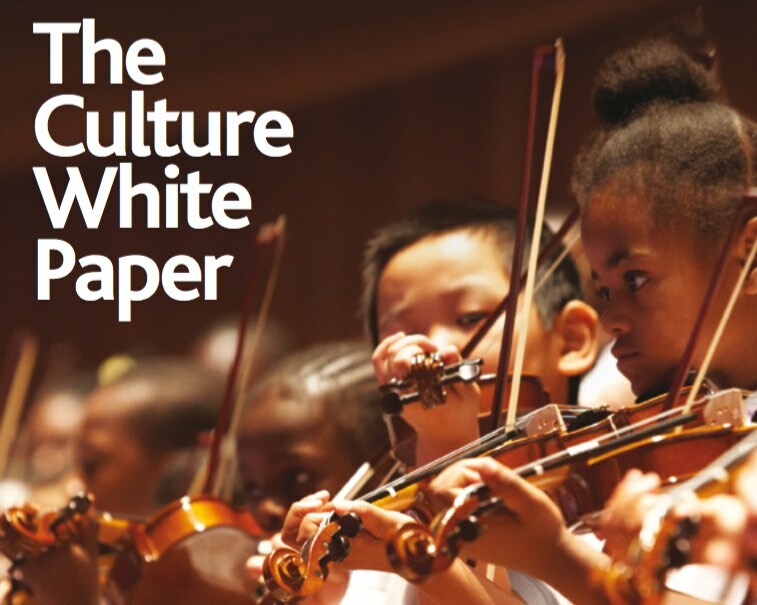 Vaizey has claimed the White Paper represents a ‘bold, new vision’, but there is really very little new here – and what one might at a push consider bold, such as putting culture at the heart of communities, is definitely not new. The paper starts with this statement ‘Everyone should enjoy the opportunities culture offers, no matter where they start in life.’ We would hardly expect anyone to say otherwise, would we, and after that things go pretty much as one might expect. The diversity of the sector needs to improve. Children should have access to the arts as part of their education. Cultural is important to place, regeneration, health and well-being. Culture helps Britain’s ‘soft power’. We need more corporate giving and diverse income streams. In many ways, the tell-tale sentence in the Minister’s introduction is this ‘Our relationship with Shakespeare exemplifies the intentions of this white paper.’ (The cover image is equally bullish in its fashion, being of an ethnically diverse set of young people playing violins.) He goes on to signal how the manifold uses of Shakespeare and his work are relevant to young people, place, Britain’s soft power, fundraising and so on. He misses the negative effect of compulsory Shakespeare in schools for some young people, and the way in which Shakespeare can represent a particular type of canonical culture. If Shakespeare exemplifies the approach, the current mixed outcomes of brilliance, life-changing discovery, engagement, boredom and disenfranchisement are likely to persist unless that relationship shifts. Jennie Lee was not without something of the same spirit, of course, and I am not for a second suggesting Shakespeare doesn’t still have the potential to be a live and vital part of our culture. (Ditto violins.) But without moving beyond such ‘great’ (or is it ‘GREAT’?) thinking, much of the paper feels like a restatement of business as usual. Amongst the new(er) proposals, there is a mix of commonsense to be worked with despite broader government policy (place-based partnerships, for instance), bare-faced cheek to be responded to through gritted teeth (education) and some ideas which are questionable if not daft. I am more than sceptical of the merits of a Commercial Academy for Culture, for instance, given all the work being done within the sector already. If Ed Vaisey really believed in the power of culture, shouldn’t this at least be accompanied by a parallel proposal for a Cultural Academy for Commerce, where the cultural sector can properly pass on its skills, for appropriate return? The ‘tailored reviews’ of ACE and HLF may make sense in the light of the place-based ambitions, though I would then question why review separately, especially as the Select Committee looked at ACE less than two years ago. (The stubborn bulldog Rebalancing does not bark in this White Paper, by the way: there is only the sound of scratching in the backyard from its mongrel pup Devolution.) The museums review is a necessary response to the growing crisis emerging due to local government cuts, and the very different nature of many museums: its not really a strategy, though. if it leads to one, it may be helpful, but at a time when ACE is likely to bring museums and libraries onto a level playing field for funding, however, careful coordination of thinking will be needed. The already announced tax breaks for museums and galleries will no doubt have benefits for some. I cannot put arguments against them in theatre better than Alan Lane did in The Stage a while back, so won’t try. Ed Vaizey may not be ‘an ideological ninja’, as Alan described George Osborne, but he knows a man who is. For me, tax breaks are not investment in culture. We should not accept them as such. If there was a big opportunity for this paper, this might have been it, to describe the describe the strategy by which Vaizey’s sincere and honestly held ambitions for culture can be progressed in the context of this government’s fiscal and legislative approach, by those of us working in and for the sector, for artists, for our fellow citizens, for whatever vision culture we believe in. But on the questions of how culture develops in a land of combined authorities and local government weakened by starvation rations and legislative change, where even the NHS see charging become normalized if not universal, how young people will discover a passion in culture under a regime of academies and Ebaccs, or how a more diverse workforce can be developed amidst growing inequality, the paper is unconvincing, to put it generously. The key distinction between 2016 and 1965’s White Papers is that now we lack the clarity and sense of strategic urgency around potential investment priorities provided by Jennie Lee’s ‘Housing the Arts’ chapter. The paucity of the ideas in the section on ‘Cultural investment, resilience and reform’ is telling. We may not need a new round of capital building to house the arts, but this section lacks a contemporary equivalent to Lee’s challenge. (If you want to compare the documents, Jennie Lee’s Policy for the Arts has been made available by US arts blogger Michael Ruston here.) Without shifting the gearstick from Evolution to Revolution, the thinking here could have been much more interesting, around things like mergers connected to place-based or sector development for instance. My first conclusion was the paper was well-meant, rather bland, unsurprisingly likely to benefit them that’s got rather than them that’s not, but essentially workable. The silences clear on closer examination don’t really change that. It’s a paper from a Conservative government, so was always going to talk about access rather than redistribution. The Chancellor who more or less protected dedicated cultural budgets believes more in control and tactics than strategy, so the need for ‘big ideas for George’ alongside proper strategic fit locally remains. This entry was posted in Blog and tagged Arts Council England, culture, DCMS, Ed Vaisey, Jennie Lee, politics. Bookmark the permalink.